This is a real Jaguar that's been gutted of its heavier parts and hung on a wall to serve as a shelf. Why? No clue. I guess that's what rich people do. Can't decide whether to put up a mural or a shelf on a wall? A mural can give the room so much character, but a shelf will prove especially useful for adding storage in that area. These innovative Fold Out shelves let you skip having to make that choice, bringing both fixtures together into one single-mounted unit. Created by Chicago-based designer Mark Kinsley, Fold Out consists of a mural painting sectioned off into multiple panels. 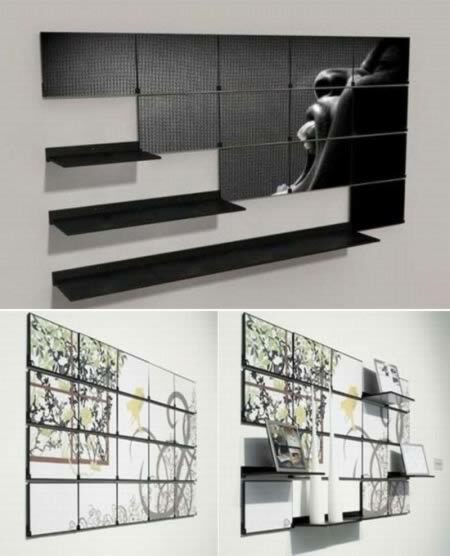 Each panel is mounted individually, with a fold-out mechanism that allows it to convert into wall shelving in one simple motion. 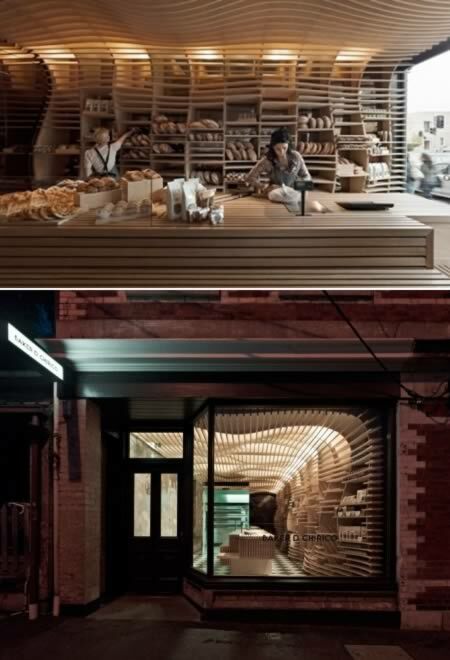 The lovely wood and shifting forms of this bakery effectively imitate the color and shape of bread. March Studio, an architectural firm in Melbourne, Australia, designed this interior for a bakery in the nearby suburb of Carlton. 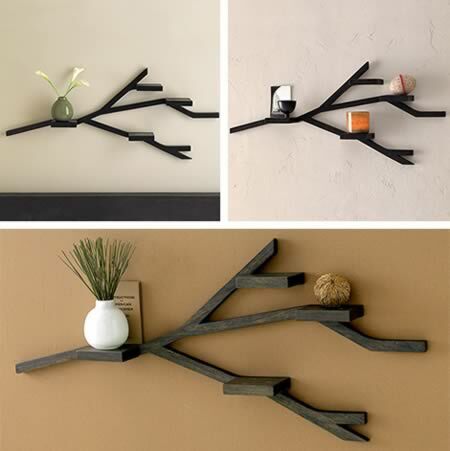 This branch shelf is made of solid wood. Available in white, chocolate brown and gray. Imeüble is a beautiful wall storage shelf-thingy by Bjørn Jørund Blikstad, a newly-educated furniture designer with a Master's degree in 2009 from the Oslo National Academy of the Arts. Germans have always been known for their love of functionality, efficiency and quality. 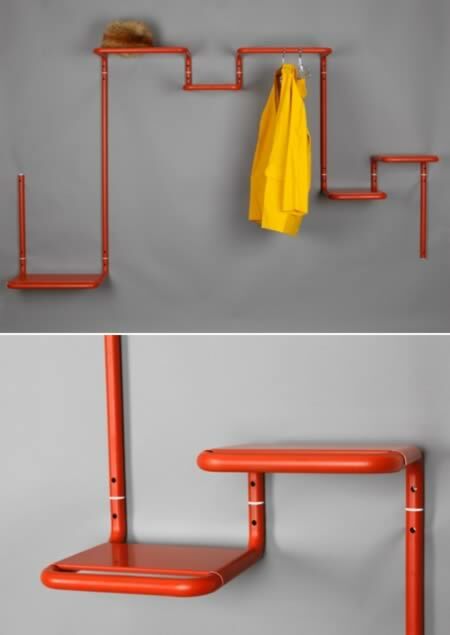 Floor 95 by Mark Brauns is a shelf and a coat rack in one, and is characterized by the above-mentioned features. The pipe-like construction is made of steel and is functional and space-efficient – it won't take much space in your hall but can accommodate many things. The design is modern and industrial, and the bright red color attracts attention. If you have a hall in a modern or industrial design and want something small and space-saving – this piece is for you. 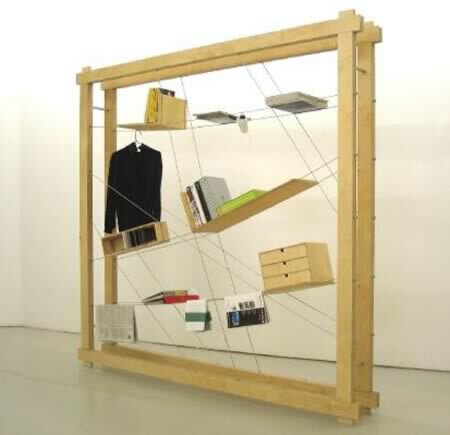 The Brace Case is designed by Ward Huting, and is a shelving unit that uses taut cables to house books, magazines and other flat objects at various angles. The modular system enables the owner to decide how to install the cables. 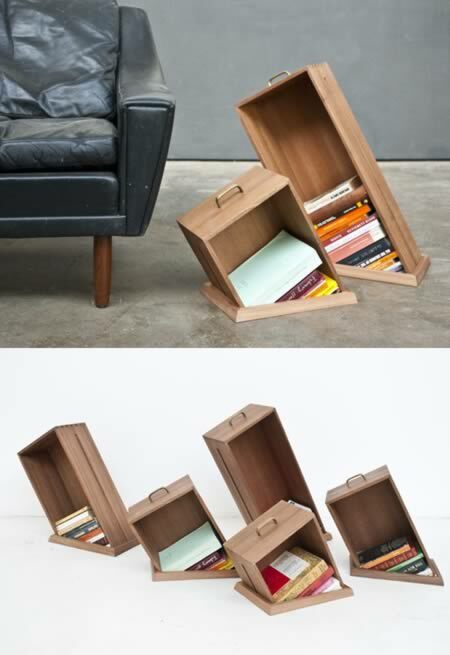 This might be an interesting approach to storing stuff, but it doesn't look too stable. The Brace Case is fully customizable according to the individual room requirements and cable length. 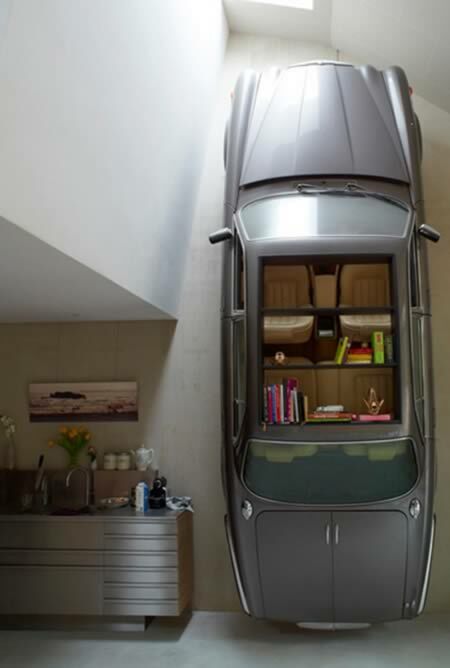 The Case is clamped between the floor and the ceiling, and can therefore be tailor-made to any room. Finally the price depends on the specific design and the amount of brace cables. This is an interesting concept — designer Maja Ganszyniec has morphed the idea of wallpaper, pegboard and storage pockets into a single product: Pocket Wall. Pocket Wall appears to be made of a stretchy plastic-like material that is both perforated like pegboard and outfitted with an occasional pocket. This is an interesting twist on wallpaper and really cuts down on the bulk of individual furniture pieces like console tables, magazine racks, etc. The collaboration between Yael Mer & Shay Alkalay led to the founding of Raw Edges, a design studio with a clever, original portfolio. This is their project called Hole in the Floor and consists of a series of ingenious shelving units. Based on the idea of things unexpectedly ending (in a physical sense), the unusual furniture pieces resemble vertical drawers which were literally sliced off at the bottom. The impression a viewer gets is - as the name of the project suggests - that of a hole in the floor. We not only appreciate the originality of this idea, but its simplicity and elegance as well. The shelves come in a variety of sizes and can be used in both traditional and modern interiors. 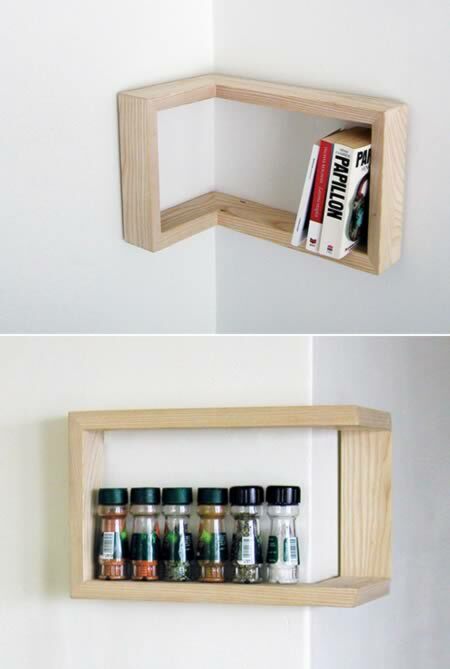 Kulma, "corner" in Finnish, is a shelf to be hung either in a positive or negative corner of a room. 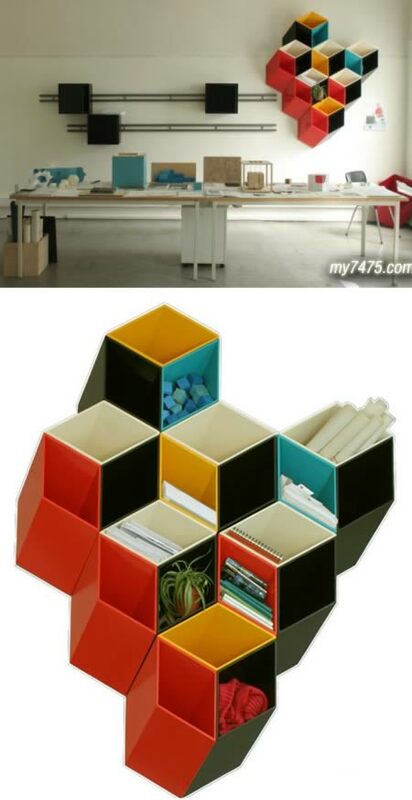 The idea is to utilize and highlight both the space within the shelf and the corner surrounding the shelf. Created by Martina Carpelan.